Under the Matchroom Boxing banner, Eddie Hearn has become the most dominant promoter in boxing. Britain has become the home of boxing with the biggest stars and the best fights. 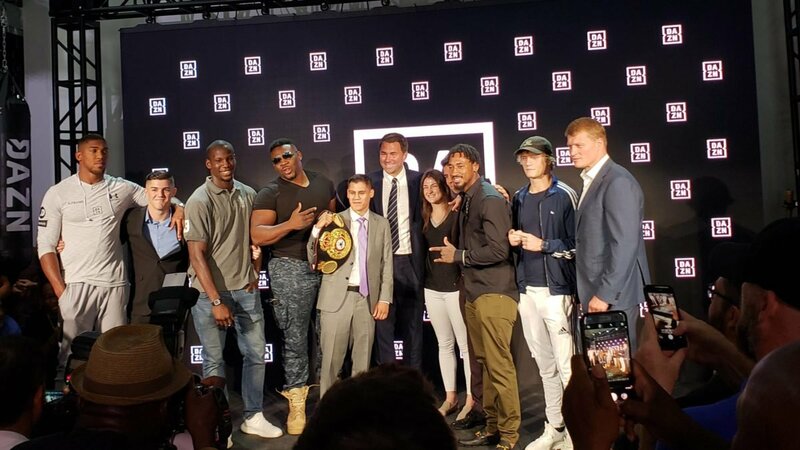 Hearn set off on a campaign to break America when he announced the DAZN streaming service in May. The streaming giant is shaping up to be a huge success. The September launch includes Anthony Joshua vs Alexander Povetkin on the 22nd and Bellator 206 on the 29th. The aforementioned MMA event looks to be the biggest in Bellator’s history as Rory MacDonald looks to become a two weight champion against Gegard Mousasi. The service will also host an exclusive October card in Chicago featuring Jarrell Miller. It does not hurt the service’s popularity that two of its biggest heavyweights squared-up at the launch event. One of which, was the heavyweight Anthony Joshua. Jarrell Miller and Joshua had an impromptu staredown, boosting the event’s media coverage. The latest boon for the service is that DAZN have struck a deal with billionaire Len Blavatnik. Hearn told Gareth A. Davies of The Telegraph that he struck a deal with Perform Group after a visit to Blavatnik’s home. It was a wise move on Hearn’s part to emulate the Netflix business model, these days all roads lead to on-demand. Hearn told The Telegraph that Blavatnik’s plan is to aggressively advance this model. “His plan is to be the Netflix of sport”. Blavatnik sits at #48 on the Forbes billionaires list. He flys relatively under the radar for most but he has been involved in many successful ventures. If anyone can make DAZN a household name, it is him. Success for the streaming service means that Matchroom can afford to sign the biggest names and book the best bouts. This is good for the sport, which is great for the fans. Previous Previous post: TJ Dillashaw vs Gervonta Davis – What Would Happen?